The previous-generation Hyundai Tucson did quite well in terms of sales, but many felt that it was a tad too small for the growing family-oriented compact SUV segment. The previous-generation Hyundai Tucson did quite well in terms of sales, but many felt that it was a tad too small for the growing family-oriented compact SUV segment. Enter the 2017 Hyundai Tucson, the all-new and latest generation Tucson that is now in its second year. The 2017 Tucson keeps all of the features buyers loved about the previous model including impressive handling and plenty of tech features, but now also offers all the interior and cargo space your family could ever need. Two engines are available to buyers interested in the 2017 Hyundai Tucson. The first is a 2.0-liter, four-cylinder engine that delivers 164 horsepower and 151 lb.-ft. of torque. This engine is paired with a six-speed automatic transmission which sends its power to the front wheels, while all-wheel drive is also available. In front-wheel drive 2017 Hyundai Tucson models, fuel economy can be as low as 7.8 liters per 100 kilometers on the highway. All-wheel drive models have an average highway fuel economy rating of just 9.1 liters per 100 kilometers. Buyers looking for even more power will opt of the 2017 Hyundai Tucson 1.6T which features a 1.6-liter, turbocharged four-cylinder engine that delivers 175 horsepower and a very impressive 195 lb.-ft. of torque available at just 1,500 rpm. Better yet, the 1.6-liter turbo engine is paired with a seven-speed dual clutch automatic transmission and has an average fuel economy rating of 9.9 liters per 100 kilometers in the city and 8.5 liters per 100 kilometers on the highway. All-wheel drive is standard. Starting at $24,999, the 2017 Tucson features a standard rear-view camera to go along with heated seats at no extra charge. There are a total of nine available versions in the 2017 Hyundai Tucson with all-wheel-drive models being available starting at $ 28,999. AWD models also feature heated rear seats, a heated steering wheel, blind spot monitoring with lane change assist and rear cross traffic alert, and a leather-wrapped steering wheel and gearshift knob. A panoramic sunroof, leather seats, dual-zone climate, 19-inch wheels, a navigation system, cooled front seats, electric seats, LED headlights, a power tailgate and a host of other features can be found in the various trims offered in the 2017 Hyundai Tucson. When it comes to safety, the 2017 Tucson is packed with standard and optional features that include a range of driver assistance technologies such as ABS braking with braking assist and electronic brake force distribution, adaptive headlights and more. And finally, when it’s time to travel as a family, the 2017 Tucson will serve you well with 877 liters of cargo space with all seats in place, and more than 1,700 liters with the rear seats folded down. 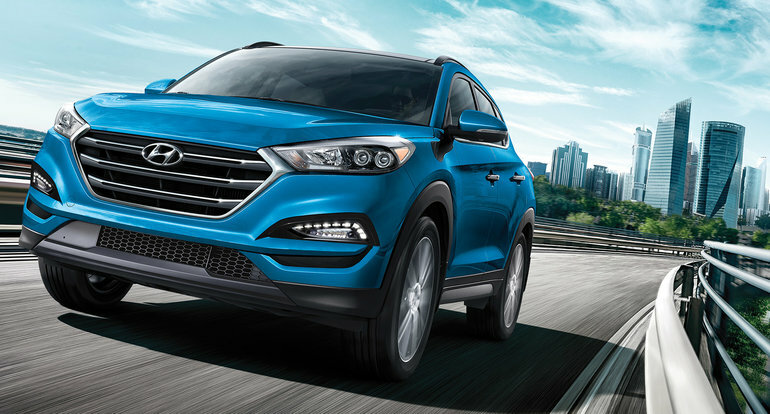 To learn more about the 2017 Hyundai Tucson, contact us today at Bruce Hyundai!